Washington - With reports that Justice David H. Souter intends to retire from the U.S. Supreme Court after 19 years, it is time to take a quick look at his legacy on education issues. Souter has been a reliable liberal vote—in dissent from the court’s conservative majority—on such major recent cases as voluntary school racial diversity and student free speech. But Souter has done his most prolific opinion writing on cases involving government aid to religion or religion in the public schools. In this case, we are clearly constrained to conclude that the statute before us fails the test of neutrality. It delegates a power this Court has said “ranks at the very apex of the function of a State,” Wisconsin v. Yoder, 406 U.S. 205, 213 (1972), to an electorate defined by common religious belief and practice, in a manner that fails to foreclose religious favoritism. It therefore crosses the line from permissible accommodation to impermissible establishment. At the end it didn't matter. As governer coumo & later pataki passed a new law (& then a new law) a few days after it was struck down twice. B"H these neshomoloch wernt affected even ONE day. The school district still stands today, without any pending litigations. Grumant (i think a meshumad) has givin up. Kein Yoivdu. ...Does anyone really think that President Barack Obama will replace the [prospective] vacancy on the Supreme Court with a Conservative or Centrist Judge! Not that Liberal, is by definition wrong. But for the prospects of establishing a school district which will be closer to serving the needs of the Religious Community in Kiryas Joel, there's little to hope for in the current administration!!! FYI Souter was appointed to the supreme court by conservative president George HW Bush! ...But he consistently voted liberal on all major issues. I remember when he was appointed no one was sure whether his opinions are liberal or centrist!!! I don't understand the complaints. You want to live in a country with freedom of religion and without favoritism toward a particular religion? Fine, then you have to play by the rules too. If you want to slash and burn the rules, don't be surprised when Christianity gains official status. And we all know how well that worked out for the Jews back in the day. Justice Souter is a bachelor. Chazal has put limits on the judicial power of dayanim who have either never been married or never had children. A man who has lived the limited non-life as someone like Souter cannot understand life; no matter how brilliant or well educated he may be, and as a result, his judgements are going to be skewed. Chasdei Hashem that we live in the greatest country in the world, but we should always realize what the limitations are and have a greater appreciation for the Torah Hakedosha and the true brilliance of Chazal. The Supreme Court has a history of having Justices who are meshugas or nebachs. There is a woman who may be a Yid who is almost a Communist. She supports the most disgusting organizations in America. What saychel she must have. Also, there is another Justice who may also be a Yid who the newspapers write seems to rest in the Men's Toilet in a nearby park. He was found beaten and dazed after a "date" a short time ago. What saychel he surely must have. Let's hope for a nes for the next appointment to this very important Judicial position. Hashem Yirachem !!! The decision to establish a special school district in Kiryas Joel did not favor a particular religion. 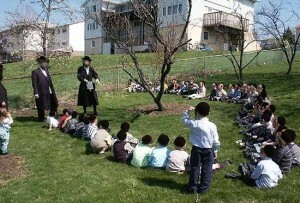 It was established to make sure that the disadvantaged children of Kiryas Joel were not discriminated against as a result of their background. The liberals on the Supreme Court who struck down the law have always overlooked the fact that the First Amendment not only prohibits the establishment of a religion, but also guarantees freedom of religion. In his dissenting opinion, Justice Scalia pointedly showed how absurd the majority opinion was. In typical Scalia style, he said that he was not sure who would be more surprised with the idea that the law in question established a religion, the Satmar Rebbe and the Chasidim, who still struggle with discrimination, or the Founding Fathers, who would never have imagined that their prohibition against the establishment of a religion would be used to strike down a law designed to help disadvantaged children. I will be glad to see him gone. If Bush nominated him, that means that Bush officials interviewed him earlier to get his judicial philosophy. If he was able to hoodwink the Bush officials to think that he was right-leaning, then he does not even have the integrity of his own convictions. It is a tragedy that he was appointed. Liberals don't support "separate" (religious) schools..